Home / Weight loss & Fitness / What do the colors of vegetables mean? Why choose a yellow over a green pepper? What is the difference between a white and purple cabbage? 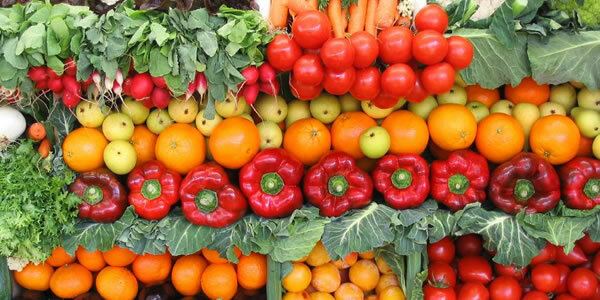 What do the colours of vegetables mean for their nutritional value but also for our health? Green, orange, red and orange, purple and white … The colours of vegetables make a colourful palette of high nutritional value. Moreover, many of the phytochemical compounds (eg carotenoids) that give vegetables their characteristic colour have been associated with significant health benefits. From where do the vegetables get their colour? The color of vegetables, as it happens in all foods, is due to ingredients that have intense color and play the role of pigments. Such might be the carotenoids that give the orange colour to carrots, mango and pumpkin, polyphenols that give the red color to tomatoes, anthocyanins, which are responsible for the deep purple grapes and berries, the amino acid derivatives containing sulfur, which produce the green color in broccoli and Brussels sprouts, and many more. Indeed, many of these substances that naturally color the fruits and vegetables are used by the food industry as coloring. How do the vivid red and orange vegetables differ from others in terms of nutritional value? The red and orange vegetables owe their color to two main categories of ingredients: the carotenoids and polyphenols. Both classes of compounds are important antioxidants. The reds protect our cardiovascular system, while the orange-yellow contribute to the good health of our eyes because of the lutein contained. What do green vegetables (broccoli, spinach, lettuce, etc.) offer to our health? These foods contain sulforaphane, indoles and isothiocyanato which according to research mobilize liver genes to create compounds that break down hazardous chemicals thus offering our body a natural detox. In many cases of vegetables, the green color is because of chlorophyll, which is a very strong green colour. Red (purple) cabbage is richer in vitamins than white? Both are an excellent source of vitamin C and a good source of manganese, folate, B vitamins and potassium as well as antioxidants. Nevertheless, if you need to compare the two, the purple cabbage has more antioxidants (e.g. anthocyanins, which owes its color), while the content of vitamin C is 6-8 times greater than the corresponding white. What is the difference between green and yellow peppers? Usually green peppers are just red or yellow peppers that have not yet matured. Also, they have a difference in taste. The green is bitterer, while the red and yellow is more fruity and sweet. The yellow and red peppers are excellent sources of vitamins A, B6 and C, as well as important antioxidants, such as lycopene, lutein (important for eye health) and zeaxanthin. The green contains significant amounts of folate and vitamin K.
Are the differences in color important for fruits as well? These differences apply to most unprocessed foods, and therefore for fruits as well. Mango, for example, owes its orange color to the amount of carotenoid contained and watermelon is red due to the content of lycopene. The antioxidant flavonoids contained in oranges and mandarins are responsible for the orange color. What color vegetables and fruits to prefer? If you want to choose based on the protection of the heart, then red is your best choice. If the goal is to shield the eyes, then orange-yellow vegetables and fruits are the perfect choice. The purple are reinforcing the immune system, while green are suitable for detoxifying the body. It is therefore suggested to eat a diet with vegetables and fruits of different colours. It should be noted however, that it is good to eat every day at least one large salad of seasonal vegetables, regardless of color.